Prop 446 will be introduced at Monday night's City-County Council meeting. This proposal, authored by Councillor Monroe Gray and listed on the agenda as co-sponsored by Council Vice President Zach Adamson, would raise the base salary of Councillors from 12% of the Mayor's base salary - or $11,400 / year - to $25,000 / year. All other items of compensation, like per diem money for attending Council meetings ($112 / mtg) and Council committee meetings ($62 / mtg; max 40 mtgs) would remain the same. Also left unchanged would be the additional compensation for serving as President ($1982 / year), VP ($1320 / year), or as a Chair of a committee ($797 / year). Quick math shows that this would increase the total Council salary by at lease $340,000, exclusive of the additional employer paid taxes. Prop 446 will be assigned to the Admin & Finance Committee, which next meets December 13 at 5:30 pm in room 260 of the City-County Building. It might be time to discuss altering the Councillor positions themselves. Full time positions would certainly pose benefits to the community. However, the number of full time Councillor positions and adequate Councillor compensation for full time work would need considerable discussion and reflection. Lobbyists are registering to conduct business in City Hall for 2016. So far, the City's Lobbyist database lists 20 individuals who work for 8 companies and represent the interests of 26 organizations. Compensation for the lobbying, when listed on the forms, totaled $471,529.46. Here are efforts, which I present divided into topics. Indy, Sports and Entertainment (which lists indyeleven.com as its website) have hired Joe Loftus of Barnes & Thornberg to lobby the Office of the Mayor. The registration notes the topic as "economic & industrial development" and a compensation of $67,410. Pacers Basketball has Lacy Johnson, Ice Miller, working for it, chatting up the City-County Council regarding "amusements, games, & sports", for $8625. Xerox Business Services is spending $54,894 with Joe Loftus, B&T, to lobby the Mayor's Office. Cincinnati Bell Technical Solutions is down for $184.87 compensation to Mark Shublak, Ice Miller, to talk with the IT Board. Election Systems and Software is plunking down a total of $19,589.74 for B&T lobbyists Brian Burdick and D. William Moreau, Jr, as well as Ice Miller's Carl Drummer. They are all lobbying the Marion County Clerk and Election Board. RBM Consulting has hired Greg Hahn, of Bose Public Affairs Group (BPAG), to lobby the same folks for $8000. Perhaps many of these folks are interested in a new Justice Center or what happens to them if one is built. CCA of Tennessee is spending $120,000 for B&T's Brian Burdick and D. William Moreau, Jr. to make a case to the City County Council, the Marion County Sheriff, and the Office of the Mayor. WMB Heartland Justice Partners has Ice Miller folks, Lesa Dietrick, Tom John, and Carl Drummer working the Department of Public Safety, the MC Sheriff, and the Office of the Mayor for $2341.53. Bingham Greenbaum Doll is employing the efforts of Joseph Smith of Faegre Baker Daniels to talk with the City-County Council, and compensating him with $1890. 3M is spending a mere $69.83 for a slice of Tom John's time with Marion County Community Corrections. DB Engineering has hired Tom John and Carl Drummer of Ice Miller to address their concerns with the Department of Public Works and the Mayor's Office - for $597.54. Infrastructure Engineering has John and Drummer talking with the same folks for $470.69. Commonwealth Engineers has engaged Kyle Walker of Kyle Walker Consulting to speak with the Department of Public Works, the topic being "environment". No compensation was noted. RQAW Consulting likewise has Walker talking with the Department of Water Works (huh?) about highways and roads/streets. Again the compensation was not listed. This lobby is going gangbusters again this year. Outfront Media is spending $16,978.35 for 3 BPAG lobbyists, John Cochran, Trent Hahn, and Greg Hahn. Trent didn't list who he is lobbying, but the other two noted the Department of Metropolitan Development and the topic of "zoning". Lamar Companies has hired the same three to lobby for the same thing with the same department - for $8850.63. Clear Channel Outdoor prefers B&T, hiring D. William Moreau, Jr., and Matthew Morgan for $5362 to chat up DMD on "zoning" matters. They also are using their own employee, John Kisiel to lobby the City-County Council regarding "other". Kisiel lists $13,875 as his compensation. Angie's List is compensating lobbyists Carl Drummer and Lacy Johnson of Ice Miller with $71,978 to address "economic and industrial development" matters with the City-County Council and the Office of the Mayor. BC Initiative is spending $38,217 for the lobbying efforts of Joe Loftus, B&T, to speak with the Mayor's Office regarding "charitable & nonprofit organizations". BC Initiative is an affiliate of BioCrossroads. Herman & Kittle Properties are down for only $37.61 for Tom John, Ice Miller, to talk about "planning/land use" with the Bond Bank and DMD. Salesforce is spending $200 on its own employee, Amy Waggoner, to talk about "other" with DMD. Bose Public Affairs Group feels the need to hire another lobbying group to represent it with the City-County Council, DMD, and the Mayor's Office on the ever popular topic of "other". They have hired Carl Drummer of Ice Miller for $839.30 in this effort. Ambrose Property Group has Drummer and Lacy Johnson, Ice Miller, dealing with the City-County Council regarding "other" for $2006.96. IU Health is lobbying the City-County Council, too, regarding Health and Healthcare. They have Lacy Johnson representing them for $6570. National Strategies, LLC, for Taser International, Inc., is compensating two BPAC folks, John Cochran and Jennifer Ping, a total of $5000 to talk "safety" with the Department of Public Safety, Information Services Agency, the IT Board, and the Office of the Mayor. The National Rifle Association has registered their employee, Christopher Kopacki, to address "other" with the Mayor's Office and the Council. His listed compensation is $197.41 for this role. Last but not least, Giant Eagle - the grocery concern - is spending $17,344 with BPAC. Three of their lobbyists, Melissa Coxey, Ahmed Young, and John Cochran are registered to speak with the City-County Council about "zoning". Greg Hahn is registered to talk about "planning/land use" with DPS, DPW, the Crime Prevention Advisory Board, the Council, the Department of Code Enforcement, DMD, DPS, the Indianapolis Economic Development Comm., the Indianapolis Economic Development Board of Directors, the Indianapolis Neighborhood Housing Partnership Board, the Metropolitan Development Committee (presumably of the Council), and the Metropolitan Development Commission. I am hoping that the registration of Ahmed Young is a foolish mistake on somebody's part, and the the ethics policy of Mayor Hogsett does not allow his Director of the Office of Education Innovation to be simultaneously employed as a lobbyist. To recap, the big money so far is on CCA of Tennessee ($120,000), Angie's List ($71,978), Indy Eleven ($67,410), Xerox Business Services ($54,984), billboard companies ($45,065.98), BC Initiative (BioCrossroads) ($38,217), Election Systems & Software ($19,589.74), and Giant Eagle ($17,344). Man, I didn't see this coming. Newly inaugurated Mayor Joe Hogsett has barely begun to get used to the view from the 25th floor and he's trying to ease the public psyche toward yet another tax increase. Fox 59 reporter, Russ McQuaid, has published his interview with Mayor Hogsett, where taxes and spending and budget deficits and wishes and wants were all discussed. At the end of it all, Hogsett said his staff will analyze the fiscal house left by outgoing Mayor Ballard and will come up with a plan within 90 days. But, talking of a tax increase? Too soon. Especially since Hogsett supports a tax increase for public transit through a referendum this year. Too soon. And to mention building a new jail in the next breath is a bit of a jarring juxtaposition. New jails don't finance themselves. Hogsett said at his inauguration that there is a $50 M structural deficit - meaning the City-County takes in $50 M less than it must spend each year. In McQuaid's piece, Councillor Jack Sandlin says the Council Democrats and Mayor Ballard agreed to spend down the fund balances for the last few years until we are at the unhappy place where "we don't have fund balances to spend down anymore...". Well, I beg to differ with both gentlemen. 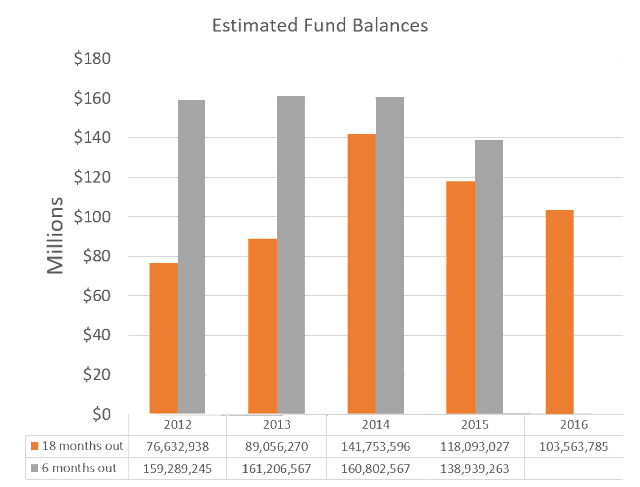 I pulled a few numbers from the 2012-2016 budgets to examine the changes in fund balances from January to December, and to see how the estimates of fund balances changed before and after the year's budget was passed. The first is how much of a deficit the City-County expected or did run each year, and the second is how well they estimated how much money would be in the bank at the end of the year. For those who don't like graphs and numbers, the bottom line is that, while we have been treated to expectations of deficit spending each year from 2011 through 2016, we have not actually spent more than we took in (after money from the sale of the water/sewer utilities is accounted for). In addition, projections of future fund balances made before the budget is finalized, always get substantially improved a year later. Every year the budget process begins mid-summer. Year end fund balances are estimated at that time. So, the numbers are estimates of money coming in and money going out in 6- 18 months in advance. The budget book contains a summary of the previous few years' budgets, moving from 'adopted budget' to 'revised budget' to 'actual budget' as the years progress. I pulled these numbers and found that the adopted budget nearly always predicted deficit or near-deficit spending each year. By the time actual revenue and expenditure numbers where known, the bleak picture had not developed. Let me pause for one second to note that I am using 'deficit spending' to mean spending more money than you take in. This means that the year end fund balances should go down between January and December if there is deficit spending. 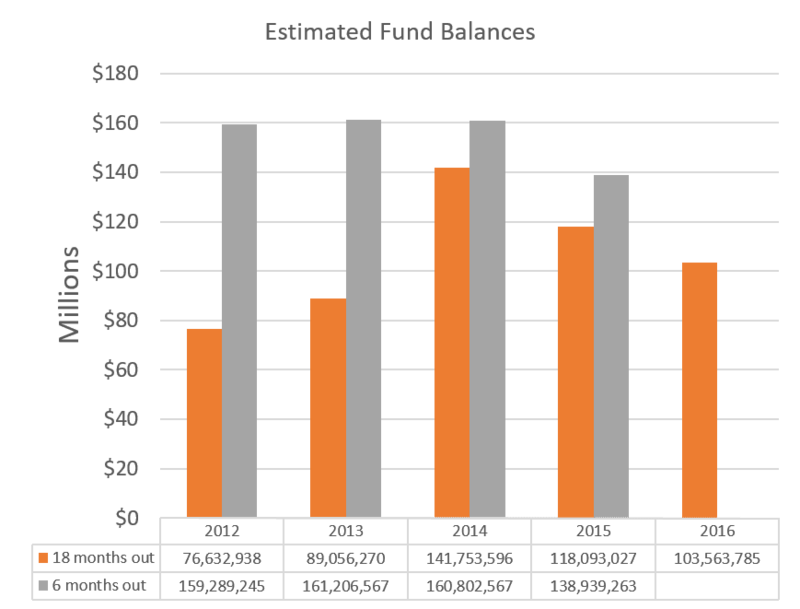 The numbers for changes in fund balance I used are those reported after one-time money is accounted for. For instance, the water and sewer utilities were sold in 2011 - giving the City a huge cash influx. That money was spent over time on infrastructure and cricket fields and $80 M was set aside in a 'fiscal stability fund', intended to recession-proof the City's AAA bond rating. 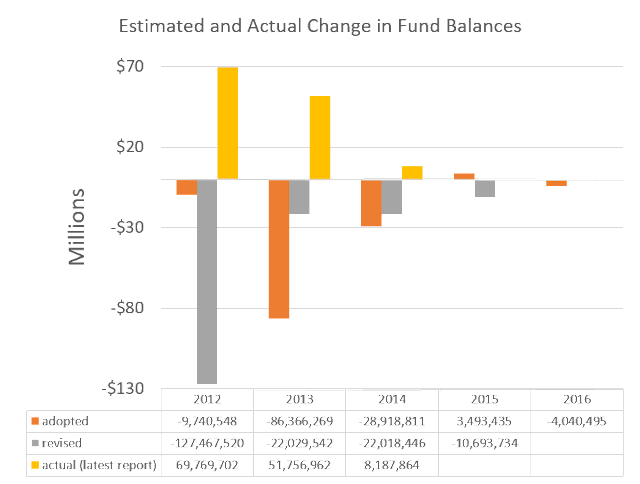 Below are the expected and actual changes in fund balance over the last few budget years as reported in the annual budget book. 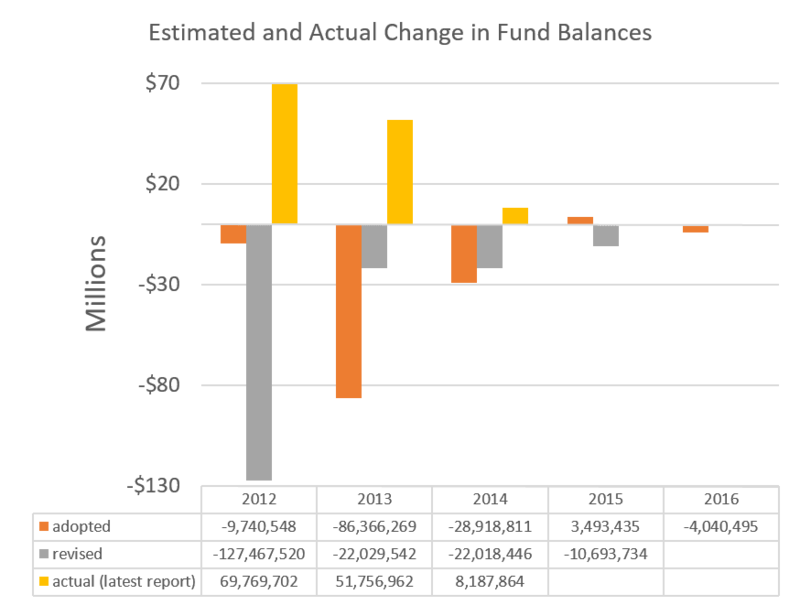 As you can see, while the predictions of fund balance changes were consistent with deficit spending, the actual fund balance changes have been positive - meaning we spent less than we took in. Of course, we await the actual fund balance changes for the 2015 and 2016 budget years. Here we see that the estimated value of fund balances actually increase when recalculated after the budget passes. The budget books don't report the actual fund balances, so I can only show you the two predictions. I include this information only to note that the doom and gloom estimates at budget time don't hold up - at least if the last few years are any gauge. True, nearly $40 M was taken from the consolidated downtown TIF in 2012 - but that was when the City was trying to wean itself off the infusion of funds Obama sent out to municipalities across the nation as the Great Recession settled in - they had gotten used to the money and the feds weren't sending as much by 2012. True, the latest budgets have been 'balanced' with 'management reserves' - forced savings across the enterprise. But, a simple budget cut would accomplish the same thing, as budgets were crafted with the expectation that 'savings' would be captured by years end. So, its not exactly overspending the revenues. Taxpayers have endured one tax increase after another - the latest round supposedly for public safety. Yet, its hard to track whether or not these tax increases have gone to the expenses the public was told they would. We will soon have a referendum on a tax increase for public transit. Stormwater management fees have gone up and will do so automatically for a while. Water rates - up. Sewer rates - up. The last few months of the Ballard regime saw tens of millions of dollars that weren't budgeted, spent on unwise contracts signed without any public review. These monies may cost us, but surely should not be used to claim any 'structural deficit'. Unwise spending on unwise contracts should be avoided in the first place. Assign a sunset date to the consolidated downtown TIF, so future mayors and taxpayers have the financial resources the TIF was supposed to create. Ditch the idea of a new jail until the resources are identified and a tax hike is demonstrated as unnecessary to make ends meet or to fund the jail. Neither should it be financed with job loss. Change the 'management reserve' system of budgeting and replace it with a 5% across the board cut - its the same thing, but deficit spending would be harder to confuse with spending within one's means. Pull jobs from high priced lawyers and consultants and cultivate those resources in house. Review all contributions to local not-for-profits that do work for the City that could be done by City employees at a fraction of the salary. It will be interesting to see what Hogsett's people come up with. But, for right now, its too soon to hint about tax increases. The data just aren't there that any structural deficit exists.